It may seem like there’s a library of government-sanctioned regulations that you need to consider when choosing a food-safe cleaning product for your operational needs. However, what many people don’t realize is that there’s actually only one registration that applies to food-safe cleaning products, the Public Health and Safety Organization’s National Sanitation Foundation (NSF) Certification. For 70 years the NSF has enforced a regulatory environment for businesses in agriculture, processing, food equipment, restaurants and food retail. Ensuring accountability from farm to fork, the NSF is known as “The Most Trusted Name in Food Safety™.” Today, the NSF mark is the only certification that identifies food safe chemicals. Because the value and trust-appeal of a food safety certification carries so much weight for consumers, there are several agencies in and outside of the government that regulate and provide certifications. Due to this variety, it’s not always easy to tell when products or brands are bending the rules to appear certified. When it comes to food safe cleaning products, a lot of manufacturing companies throw around terms like “USDA-approved” or “FDA-approved,” but in reality, those claims have no real meaning when it comes to food safety. The only organization responsible for certifying food-safe cleaning products today is the NSF. To the uninitiated, the first agency that comes to mind when thinking about food safety is likely the United States Department of Agriculture (USDA), the department that monitors and regulates safety practices for food manufacturers. There’s also the Food and Drug Administration (FDA), which regulates everything from food, drugs, biologics and cosmetics, to veterinary products and radiation-emitting electronic equipment. While both the USDA and FDA play a role in the overall food safety picture, neither are responsible for approving chemicals for food safety. The NSF Nonfood Compound Production Registration was founded in 1999, picking up where the USDA’s authorization program left off. The program was established to evaluate the risk of contamination from chemical compounds used in and around food processing facilities and to ensure consumer products perform as claimed. NSF International is recognized around the world for its scientific and technical expertise in the health and environmental sciences. NSF’s audit staff has conducted more than 165,000 inspections in more than 167 countries to date. When choosing the right chemical for your cleaning needs, look for the NSF seal to determine if a product is actually food safe. The NSF mark is recognized as an international symbol of quality and safety. Using registered products can help your business meet your Global Food Safety Initiative (GFSI) requirements. 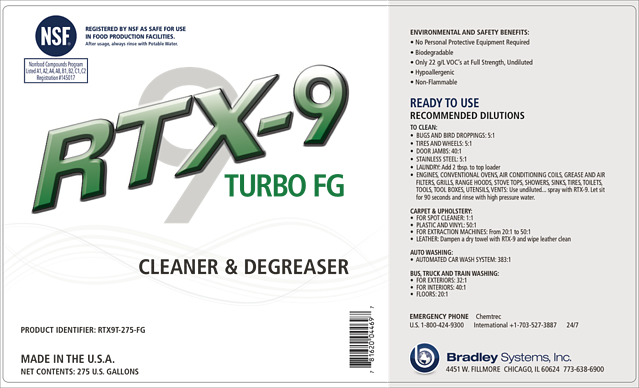 For example, products like our Yellow Magic 7 and RTX-9 Turbo Food Grade are specifically designed for use in food and related industries. From facility conveyor belt systems to transportation and processing, even animal feed processing, packaging and labeling, we do our part to not only meet but exceed government regulations for food safe cleaning products. If you’re unsure if products you’re using are verified and NSF-registered, visit the NSF White Book for a full list of registered products. Not sure how to identify and handle Class 8 corrosives? Download our free white paper for everything you need to know.